A new video showing a Tesla with Autopilot engaged bouncing of a highway median has just been posted by the owners of the Tesla. The video below tells the tale, but we would like to add perspective as well. 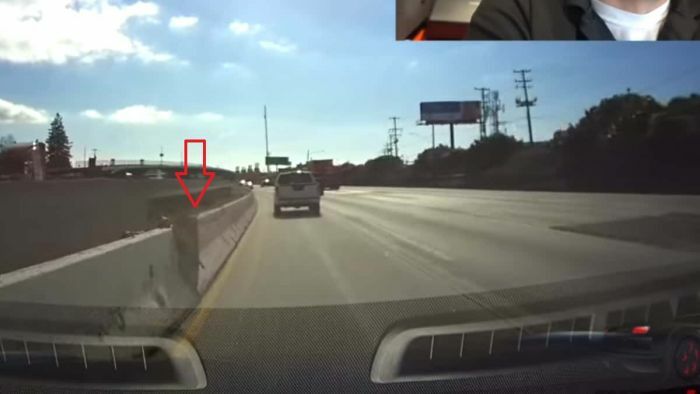 In the video, the Tesla is driving on the highway with Autopilot engaged. As the co-owner narrating the video says, the driver is ultimately responsible for the safe operation of a Tesla. At least that is in the Autopilot fine print. The driver is, we think, recklessly trusting Autopilot to navigate in an area where even a very attentive driver may struggle to remain in control and safe. The construction is intruding very closely onto the open lane. This is an area where a lower speed and perhaps a lane change would be prudent. The driver and Autopilot do not slow down, do not change to a middle lane and do not seem to respect the construction zone's realities. At least one driver has died in a construction zone in a Tesla operated with Autopilot engaged. A Model X hit a barrier head-on. That driver reportedly had made issues with the Autopilot's system known to Tesla and he still trusted it with his life. Other Tesla vehicles on Autopilot have driven into semi trailers, police cars, and firetrucks. Some were fatal crashes. Autopilot has a problem recognizing some fixed objects according to an MIT researcher working on Tesla Autopilot data. As this latest video shows, that is still true. Those fortunate enough to have a luxury vehicle with amazing capabilities still need to respect the boundaries of those vehicles. If not for their own protection, the safety of those who are near them in traffic. This crash had a very positive outcome. Nobody was injured. The Tesla will be repaired and returned to service for its owners. It should be a reminder to owners and those who plan to purchase a Tesla that the Autopilot system is not infallible. Just like human operators. If this were your Tesla, how would you have operated the vehicle differently? Tell us in the comments below. Source Note: Hat tip to Eric Loveday at Motor1, where we first saw this footage. This goes back to people's unrealistic expectations for autopilot systems to work flawlessly 100% of the time. The point that I think about is that humans certainly do not work flawlessly 100% of the time. And that in the time that it took to read this comment, some human driver somewhere scuffed their wheel on a road irregularity, or didn't see a road construction change, or was distracted while texting and had a minor accident. And that works out to hundreds of these kinds of incidents and accidents every single day. The difference is that with your average human driver, their error of judgement or lack of attention that causes a minor accident will perhaps make them pay more attention next time, or not. But with a learning autopilot system, every reported mistake will be reviewed and the software will be revised and improved over time, and the new improvements will be automatically updating all of the Tesla cars that have this driving assist software. And personally glad that Tesla is sticking their necks out to support this new safety technology that will benefit all drivers in the long run.